Effective and timely commercial local delivery within California requires a combination of know-how and the requisite transport infrastructure. 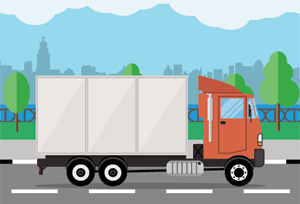 3PL Center offers a range of trucking solutions including local California delivery services. Looking for Local California Delivery Services? Our local California delivery services are tailored to be fast, affordable and easy to use. Effective California delivery is certainly not a simple process of loading products onto a truck and sending them to a destination. Unless the process is carefully planned and choreographed, the risk of late deliveries, damage to goods and other complications increases. At 3PL Center, we have perfected the art of local California delivery services. This translates to cost effectiveness and hassle free logistics. Why Should You Choose 3PL Center for Local California Delivery Services? With over 45 years of combined experience in the provision of fulfilment and transportation services, 3PL Center has grown to become an obvious choice for local California delivery for many clients. This is a result of a philosophy of always reinventing our service provision to best suit our customers’ needs. We make it a priority to provide individualized services, as we understand that each local California delivery project has its own goals and challenges. By individualizing each project, we ensure that the outcome of every interaction with our customers is positive. In simple terms, you can depend on us for delivery of goods within California in such a manner as to keep your business competitive. One of the benefits that clients can expect to get when using our services is an advanced shipping and inventory system. We keep updating this system to cope with changing times, resulting in it being one of the most reliable in the market. Quality tracking and transportation of goods is therefore available to your business at a reasonable cost. 3PL Center has great experience in handling a wide range of goods for transportation. Even if the delivery has strict terms and conditions associated with it, we will provide the best logistics to fit the need. You can therefore keep your faith in us when it comes to handling of all kinds of products, including those that need careful handling due to their sensitive nature. To top it all off, you will have our customer care team on call 24/7, which further ensures that you will never be in the dark about your consignments, and will always find it easy to reach us. We are therefore the ideal choice for local California delivery services. We work with both big and small companies, so even startups can take advantage of our services. No matter what industry you are in, you can rest assured that the local California delivery services we offer will suit your needs. Ready to Experience the Best in Local California Delivery Services? If you want to make use of our local California delivery services or simply have questions regarding the services, don’t hesitate to contact us. You can give us a call at 732-391-2500 or email us at sales@3plcenter.com any time.